Lovely. An excellent representation of the greedy Indian stereotype. This says it all about how most people view Indians today. 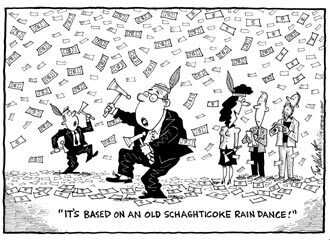 According to this Englehart cartoon, the Schaghticokes are fakes. They engage in stereotypical behavior—wearing feathers, waving tomahawks, doing a rain dance—to get rich. All they want is the money available through Indian gaming. Of course, the Schaghticokes have been pursuing federal recognition for 25 years. High-stakes gaming has been an issue only 16 years—since Congress passed IGRA in 1988. So the Schaghticokes pursued federal recognition for nine years without thought of opening a casino or getting rich. So much for the aspersions cast by this cartoon. And for the likes of Connecticut's carpers, Blumenthal and Benedict, and West Virginia's anti-Indian Wolf. For the basics on the Schaghticoke decision, see Benedict: Schaghticoke, Eastern Pequot Tribes Are "Bogus."